A wonderfully uncomplicated opportunity with surprising rewards. Molly Maid is a leading home-services and cleaning franchise that’s been honed and perfected for 28 years – well there is hardly anyone to whom the brand would not sound familiar. The investment is reasonable taking into consideration the brand awareness and market presence. In terms of profit and ROI Molly Maid Franchise opportunity is exceptional offering you a higher return and a recession proof business model. When mentioning “recurring and predictable cash flow” we mean what we say. What is the story behind the scene? As David McKinnon, CEO and Founder of Molly Maid Franchise : Giving back is the key – we give back to the community, clients and our franchisees. Molly Maid Cleaning Franchise Opportunity offers an internationally respected brand name, attractive return on effort, family-friendly working hours, a network of 700 peers, and repeat customers who generate multiple recurring revenue streams. Our owners build the largest franchises in our industry … with the lowest upfront costs … with the lowest advertising budgets … with world class demographic & software tools … with access to some of the best people in franchising …and continued growth & success over the life of the business. 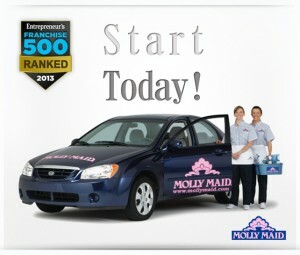 Please do not miss to claim your free Molly Maid Franchise Insight! Call Free 1-800-544-2161 or Request a Call Back for regional franchising opportunities in your area.